JAKARTA, INDONESIA (ANS) — A married couple has been convicted and sentenced to prison for their suspected involvement in the bombing of three churches in Indonesia’s second largest city, Surabaya, in May 2018. The attacks are an indicator of growing religious intolerance which has been observed in Indonesia in recent years. There are concerns that such intolerance could be a factor in Indonesia’s upcoming elections, which are scheduled to take place next month. Agus Satrio Widodo received sentence of eight years, and his wife Damayanti was given three years and four months after a West Jakarta court found them guilty of ‘aiding criminal acts of terrorism’ and ‘being involved in a criminal conspiracy’ on March 14. The couple, along with a third defendant, were sentenced in connection with a series of suicide bomb attacks on three churches in Surabaya that were carried out by a single family on May 13, 2018. 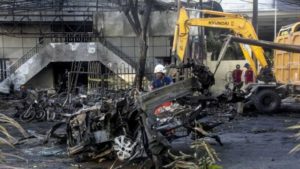 At least 14 people were killed and more than 30 injured in the attacks, which were described at the time as the worst terrorist attack in Indonesia since 2005.